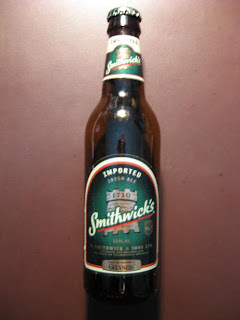 Smithwick's Brewery / Irish Ale Breweries Ltd. Deep forming head; looks like cotton candy. Significant lacing to the bottom the glass, leaving 'clumps' of foam. Hints of chocolate and deeply roasted malt. Great body and delicious finish. Lads, simply another heavenly religious experience...brewed since 1710 in Kilkenny at the St. Francis Abbey Brewery, dontcha' know? It's wee in alcohol at 4.5%, but readin' about this beer you de-scover the domestic Irish version is even wee-er at 3.8%. Odd that the 'yanks get the stronger version. Also, you need to be knowin' that this here is the oldest brewery in Ireland at mere 300 years young. Must have taken a lot for the Irish to put aside uisge making (for a little while) to start an ale brewery, because uisge baugh is the 'craic' in Ireland. Saints preserve us all, for that! This beer was fulll of sudsy head and smelled like liquid whole wheat bread...yummy. Interesting side note: the 'W' is silent when you be pronouncin', like, 'Smiddicks' or 'Smithicks'. Anyway, tis a great day to be Irish, so get out there and be wearin' the green and drinkin' this red!